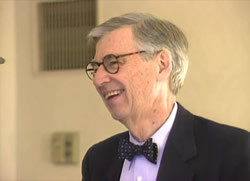 In a 1998 episode of Candid Camera, hosted by Peter Funt, Fred Rogers enters the hotel room where he will be staying while attending a PBS conference as the keynote speaker. The gag is that there is no television in the room. 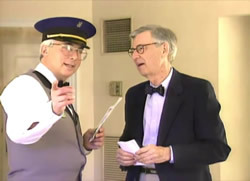 Rather than respond with frustration, Fred surprises viewers and Mr. Funt himself (acting as the bell man) by cordially suggesting that he doesn't "use the television anyway" and that he has "enough TV in [his] life." It is likely that this took place at the Langham Huntington (then the Ritz Carlton) in Pasadena, California. 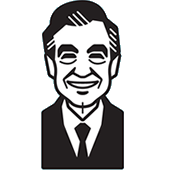 According to the Pittsburgh Post-Gazette's Rob Owen, this was the location of an annual press tour and Fred Rogers was in attendance to receive a lifetime achievement award from the Television Critics Association. This means that this clip would have been filmed in July of 1997.